Are you sure this is a chain restaurant? Stormy: "How about Black Rock?" Me: "Is that a chain?" Stormy: "Yes, but they only exist in Florida and Michigan." Me: "Lets give it a shot." 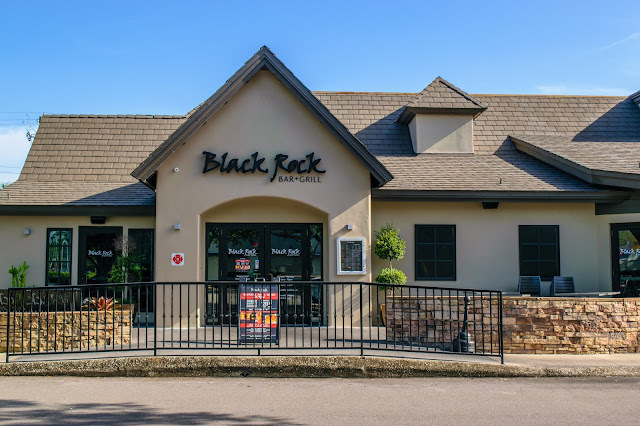 Black Rock's whole gimmick is that, if you chose to order their steak and/or seafood, they serve it raw with an "inch thick piece of volcanic rock." I'm going to leave that in quotes. 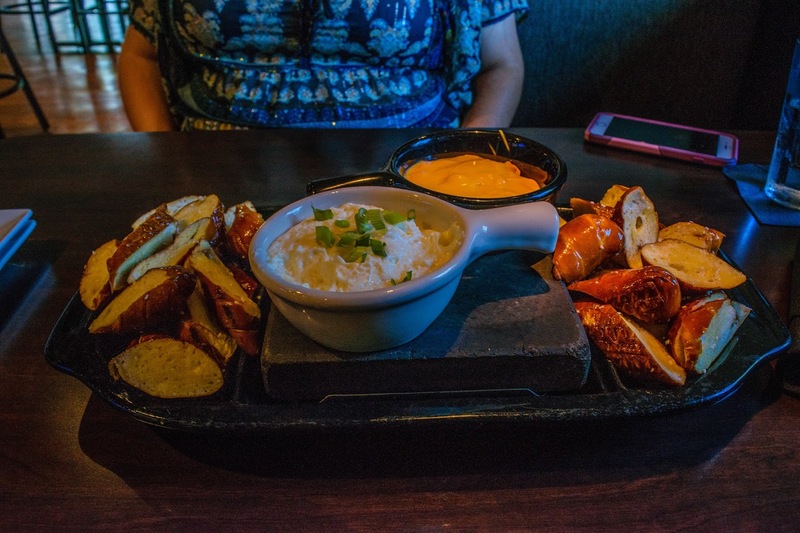 The food comes out, you chop it up into bite size pieces, and then you cook your own steak and seafood on this rock at the times on the menu. The longest wait I saw was one minute for the seafood. I wont lie, it is a gimmick and I found it to be kind of a stupid gimmick. That said, I'll probably be back to give it a try sometime. Another aspect we didn't check out was their bar, though they did look to carry a handful of decent, locally made beers. We had a movie to catch, though. Beer would have to wait. The interior of the building was gorgeous, and it was pretty empty too. No competition for seating and a nice view of Dale Mabry as we ate. The picture of the bar above doesn't do this restaurant justice. But you didn't click on this link to hear me rave about the interior, did you? No! You came to hear about the meat and potatoes (literally). First, I have to give a huge shout out to our waitress, Jamie. She was attentive, fun to talk to, knowledgeable about the movie, and she took of us while we were there. If you do choose to check this place out, I'd definitely sit in her section! Anyways, Stormy and I opted to start with the pretzel bites with the garlic cream cheese and nacho cheese dips. 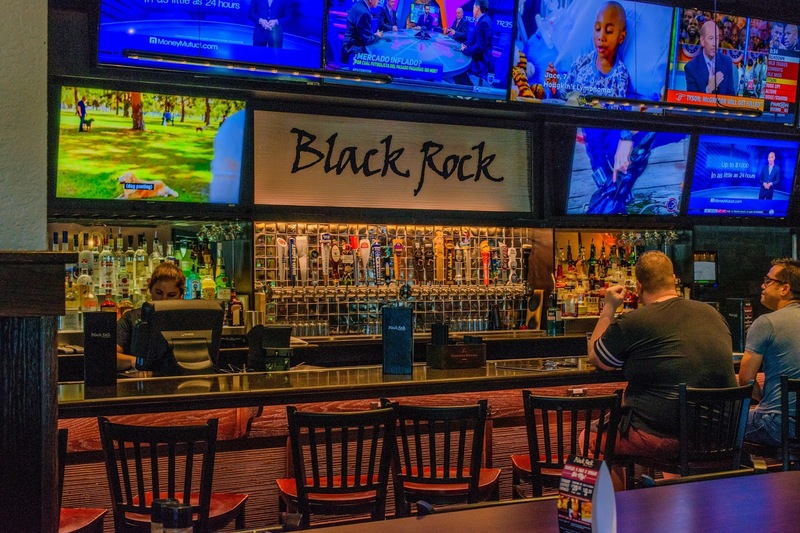 This app comes out with the dips sitting on top of one of their black rocks with two sides of pretzels on either side of the rock. Easy to share. The dips were amazing and the pretzels were also just right. The garlic cream cheese dip had just the right amount of spice without being overbearing, and I tend to lean towards that dip over the cheese. The cheese was also very good, and got a lot better as you got towards the bottom. Then came the actual meal. 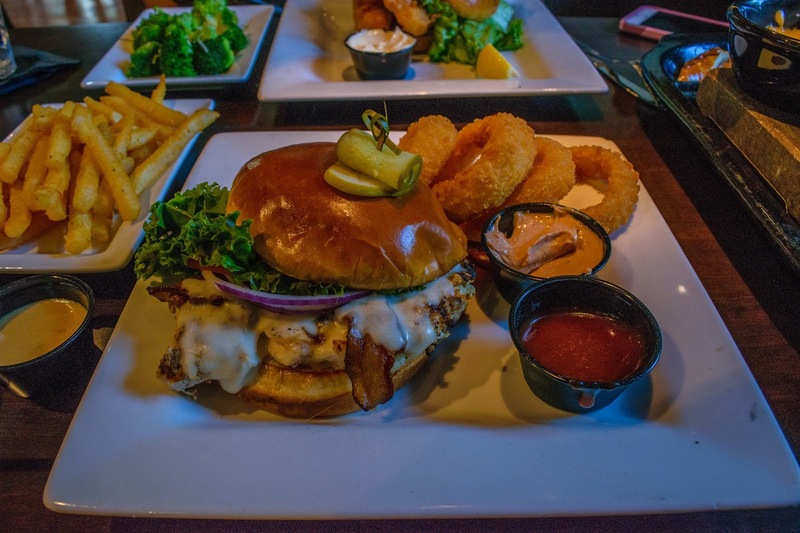 I opted for a Black Rock Chicken Sandwich with onion rings and Stormy got the fish sandwich with Parmesan broccoli. The chicken sandwich was advertised as coming with "rock sauce" and said sauce came on the side. I thought that was kind of weird, but I dumped it on top of my sandwich anyway... I will say, the rock sauce was probably my least favorite part of the meal. Luckily, the sandwich itself was good enough to overpower the taste of the sauce. The onion rings were nice and crispy which is about all you can ask for. The chipotle mayo was a nice tough as well. Stormy's fish sandwich, which they claim is beer battered cod, was one of the best pieces of fish I've had recently. Full disclosure: I also haven't had much fish recently. The fish was still excellent, though the broccoli didn't seem to have much in the way of Parmesan. Excellent meal, regardless. The best part about this place was the price. It definitely didn't break the bank, and we managed to get REALLY full while there. The portion sizes are ridiculously big. - It is a chain, though the quality of the food will shock you. - It's not as expensive as it looks from the outside. - Jamie is the waitress you'll want to have. She was easily the best waiter/waitress we've ever had that we haven't built a relationship with. - The portion sizes are huge, and even for a fat man like me, they were difficult to put down. - You will have to cook your own steak and seafood. - There are some craft beers, but not many. -We have new t-shirt designs in our Spreadshirt store. Check them out! How do you feel about having to cook your own steak? What is your favorite chain restaurant? Leave a comment below. If you'd like more information on Tampa, check out my YouTube Channel and if you'd like to support my efforts, don't hesitate to buy a shirt from our Spreadshirt (New designs!!). Also, don't be afraid to click subscribe and you'll instantly be notified whenever a new entry is posted. Thank you all and I will see you next time!